What can be more captivating then a journey on the legendary Trans−Siberian Railroad, one of the greatest adventures in the world! 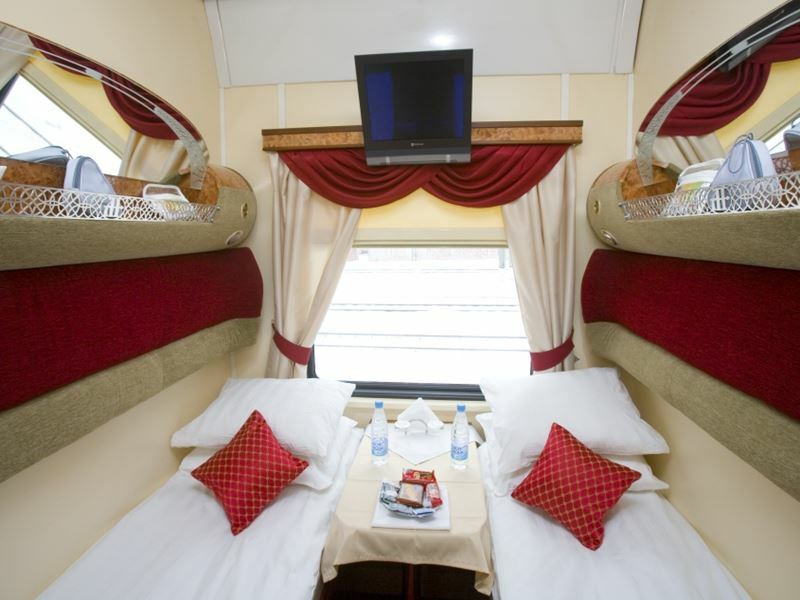 The Imperial Russia train offers an amazing travel experience, taking you through the scenic landscapes of Russia, Mongolia and China. Another perspective of the journey is to see world metropolises such as Moscow, Ulaanbaatar, and Beijing. Arrive in Moscow today, where you will be met at the airport and transferred to your hotel. You can choose to enjoy your down time at your hotel room or make a discovery walk of the hotel vicinity. This evening you will enjoy dinner on your own. After breakfast, you will enjoy the panoramic tour of Moscow that give you an idea of capital’s dimensions. Explore the Red Square, the very heart of Moscow, with picturesque St. Basil’s Cathedral or enjoy the ride in Moscow subway with the stations that are more likely to be underground palaces. Upon arrival in Kazan, once the capital of the Tatar Khanate you will depart for City Tour to explore the Old Kazan. Today, in the White Kremlin of Kazan, a new mosque rises in the immediate vicinity of a Christian cathedral. Today we arrive in Yekaterinburg & start our discovery of this city that is closely connected with the family of the last Russian Emperor. During the tour, you will visit the memorial Church on the Blood to commemorate the tragic events taken place in this city. We arrive in Novosibirsk, the very heart of Siberia, and start our tour of the city right from the railway station – a local railway museum dedicated to the legendary Trans-Siberian railway. 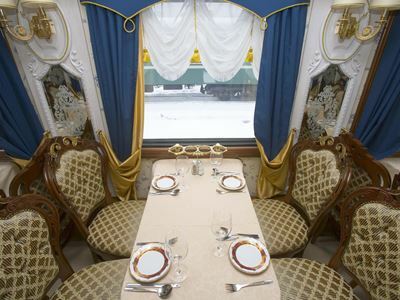 Your «Imperial Russia» train keeps traveling through Siberia. Today enjoy your stay onboard to reflect on cities you have already visited. You may want to spend your time having a drink at the bar with your fellow travelers, or you might stay in your cabin and follow the changing scenery. Our train arrives in Irkutsk today, one of the largest cities in Siberia. This city has preserved quite a few of historical buildings and monuments. During the city tour you will see picturesque wooden houses, visit the Decembrists’ House that will unfold the story of failed uprising of Russian aristocracy who were exiled to this city. Standing on the shores of Lake Baikal, you can’t help being awestruck with admiration by the wonder created by nature itself. It is the deepest Lake in the world that contains the fifth part of the Earth’s fresh water. After breakfast, board a motor ship to sail on the waters of the Baikal to the village of Listvyanka. 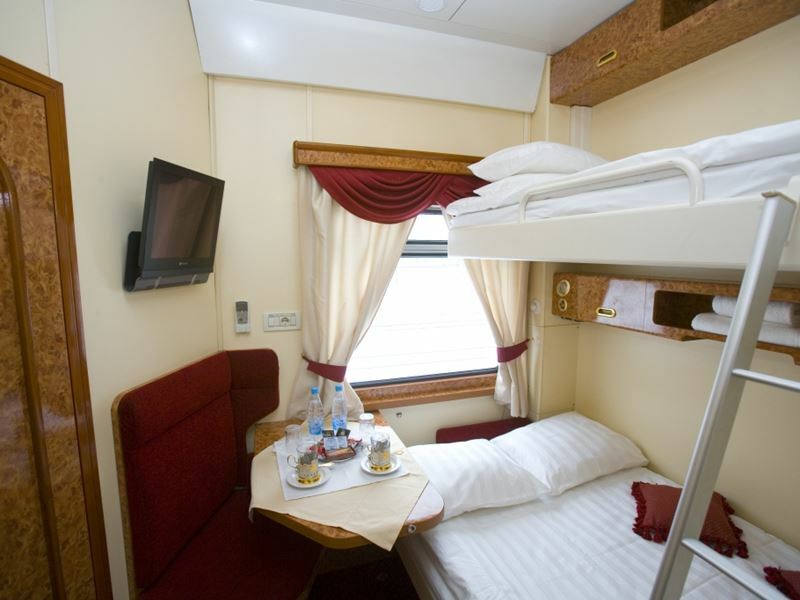 «Imperial Russia» train will stop in Ulan-Ude today, the capital of Buryatia. A special spiritual experience is a visit to an active datsan, Buddhist educational and religious center. Beijing is the final destination of your railway journey that has led you across two continents. It is home to millions of small shops and street traders, the place to shop for souvenirs and bargains, and the last opportunity to taste the delicious Chinese food in all its variations. During the city tour you will visit the Forbidden City, the Tiananmen Square and the Hutongs. NOTE: The itinerary is subject to change. Doctor on board, English speaking group leader and tour managers. Vaccination: consult your doctor or medical center for specific health advice, due to visit of different countries in terms of this Tour. 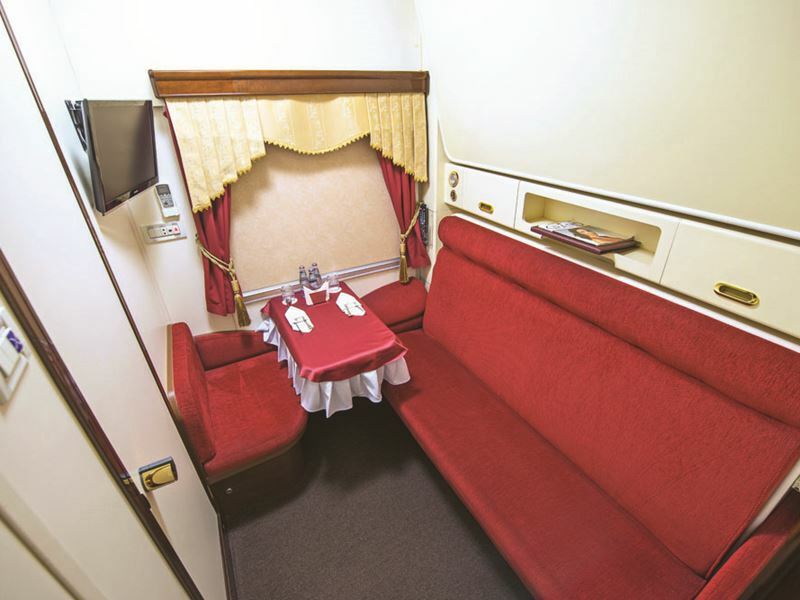 $1,500 US – per person in COMFORT CLASS compartment. Cancellation of a confirmed reservation 75 days prior to departure is subject to penalty at the rate of 50 % of the tour price. Cancellation of a confirmed reservation 45 days prior to departure is subject to penalty at the rate of 100% of the tour price. 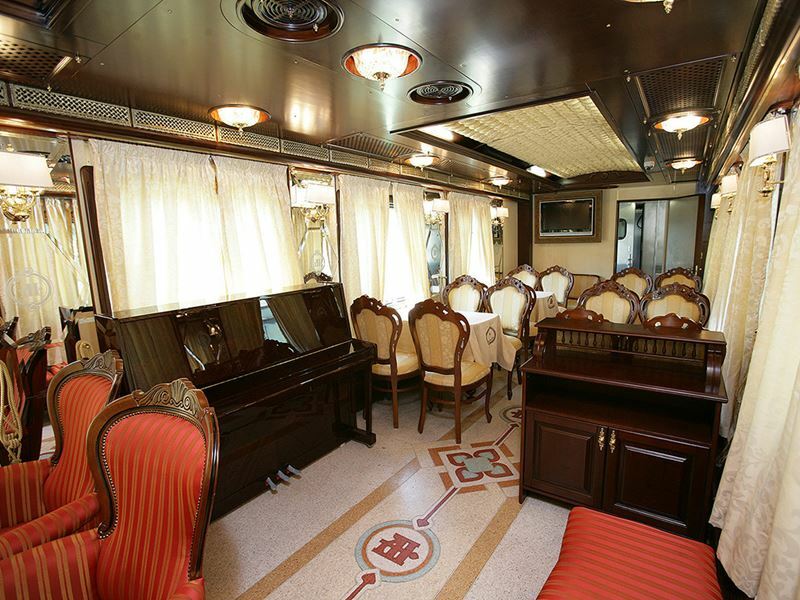 Consists of 8 passenger compartments, 2 lower berths in each and are equipped with a table and LCD TV set. In compartment 9 there is a shower booth with a washbowl. Two water closets: in the beginning and the end of the car. The air conditioning system is general, with an option of additional temperature control in each compartment. Consists of 8 passenger compartments, 2 berths in each. Berths: one upper, one lower one. All compartments are equipted with a table with an armchair. 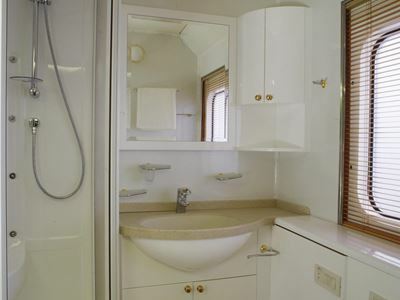 Between compartments, there are four rooms with washbowls and shower cans. 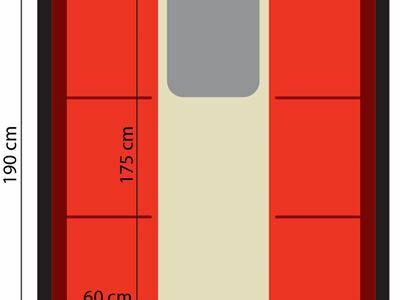 In compartment 9 there is a room for storing luggage. Two water closets: in the beginning and in the end of the car. The air conditioning system is general, with an option of additional temperature control in each compartment. Most cars are equipped with LCD TV sets. This type of car contains 6 compartments. 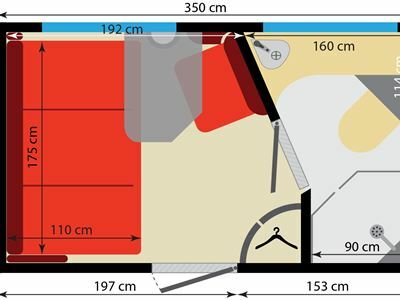 There are two berths in every compartment: a sofa that transforms into a semi-double bed 120 cm wide, and the upper berth of width of 90 cm, a chair and a folding table. 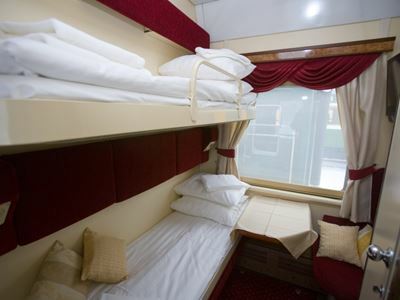 All compartments are equipped with a private en-suite bathroom with a washbasin, toilet and wet shower. An individual air conditioner for heating and cooling the cabin. This type of car contains 5 compartments. 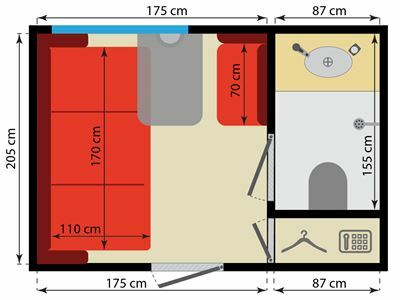 There are two berths in every compartment: a sofa that transforms into a semi-double bed 120 cm wide, and the upper berth of width of 90 cm, a chair and a folding table. 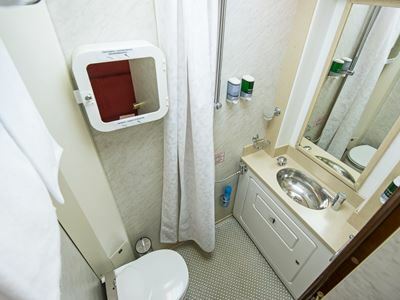 All compartments are equipped with individual water closet with a shower booth and a washbowl. An individual air conditioner for heating and cooling the cabin. 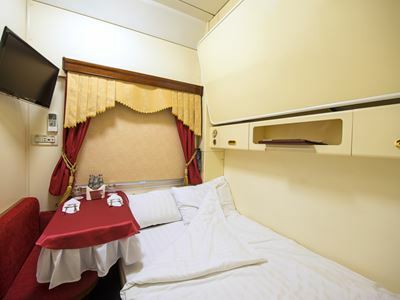 Dining cars, usual for long-distance trains, are equipped with a dining room, kitchen, audio/video broadcasting, inter-car communications system and air conditioning. 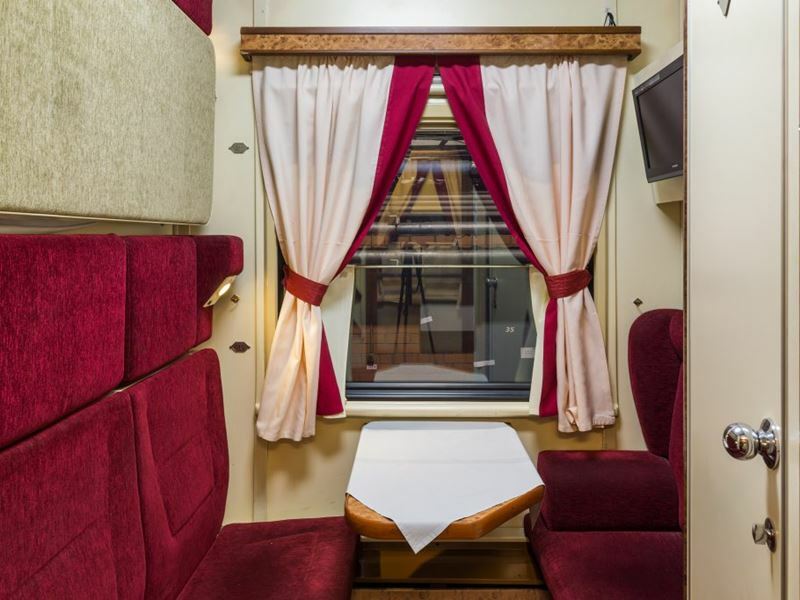 Interiors of dining cars are made from environmentally friendly and fire-resistant materials. 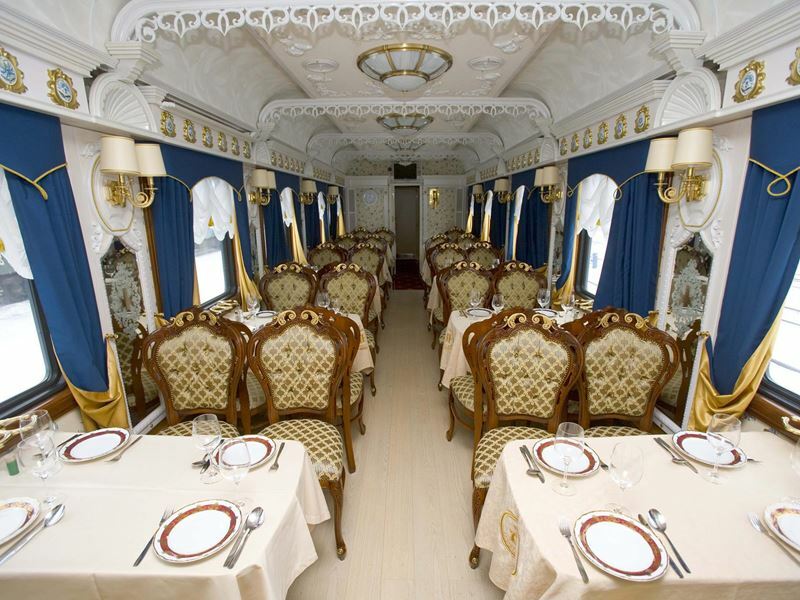 Please note there shall be several modifications of dining cars in different styles to be used for our tours. At our website you will find photos of some of the cars. 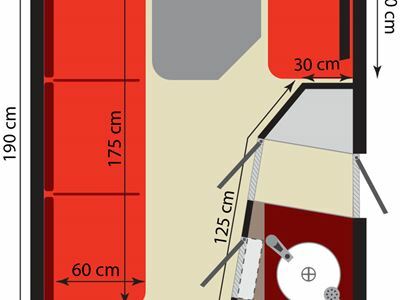 A unique car with a music saloon, divided into two functional areas: an area with comfortable armchairs and a restaurant area with a dance floor, equipped with the piano. The bar car is ideal for cocktail parties, theme parties, holiday events. Please note there shall be several modifications of bar cars in different styles to be used for our tours. At our website you will find photos of some of the cars.